Personalization, videos on product detail pages, and content marketing are among six important online shopping trends that are impacting ecommerce business practices, according to a new study. iVentures Consulting, a management and digital business consultancy, released its annual eShopper Index on March 18, 2015. The report looks at the online shopping experience that 111 well-known ecommerce sites provide before, during, and after a sale. For each of the online stores, which included Amazon, Zappos, Macy’s, Target, Nike, and similar, iVentures places several orders, interacts with customer service, and eventually returns the goods it purchased. 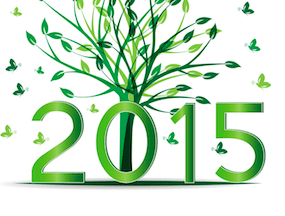 For its most recent index, iVentures made purchases from September to December 2014. At each step for the purchase and return process, iVentures subjectively measures the customer experience and ultimately scores how well it believes each of the 111 sites in view performed. With the study, the consultancy seeks to identify trends. Given that the companies the survey monitors are among the industry’s leaders, these trends may represent general changes to ecommerce business practices or areas of opportunity wherein merchants can gain a competitive advantage. As such, these trends could eventually impact even small online sellers. Perhaps the greatest opportunity that iVentures identified was personalization. The idea of presenting personalized content or offers is popular. It seems almost obvious that using behavioral data to show shoppers the products they are most likely to buy will boost sales. And some online sellers have reported massive increases in sales thanks to personalization. As an example, American Apparel, which was included in the iVentures study, reported in 2013 that its on-site personalization had contributed to a 59-percent increase in sales from 2011 to 2012. In spite of the promise of increasing sales, only 13 percent of the 111 sites studied personalized page content based on customer browsing history or customer purchase history, according to iVentures. Even fewer online sellers used personalization in their email campaigns (just 8 percent) or on mobile (only 4 percent). 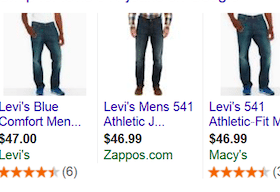 In spite of its promise to boost sales, personalization is not yet widely used on ecommerce sites. The gap between what personalization is capable of and its use may represent an opportunity for small and mid-market retailers. While personalization may represent an opportunity to get ahead of competitors, content marketing has become something online sellers must do to keep up. The eShopper Index found that 65 percent of the sites reviewed used lifestyle photography beyond just product pictures — think lookbooks, as an example; 61 percent had an online magazine or a blog; and 50 percent offered some form of editorial content like useful tips. 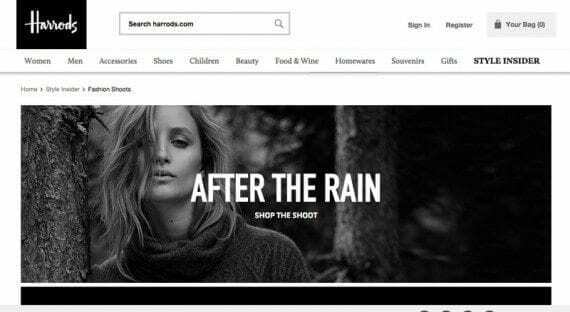 Harrods was a leader in its use of content marketing, including using fashion shoots to sell products. As an example, Harrods uses fashion shoots or lookbooks to show off new styles and engage shoppers. The site also has several editorial features, including fashion news, fashion show commentary, style trends, interviews, a regular top five feature, and much more, all collected under the site’s Style Insider section. An ability to share on social media. In addition, product videos appeared frequently. Some 32 percent of the sites now include product demonstration videos on at least some of their product detail pages. 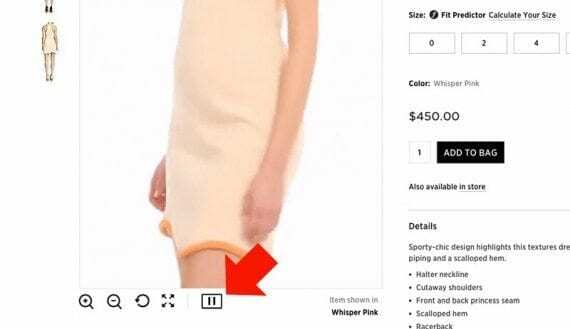 As an example, Saks Fifth Avenue has a play-pause button just below the main product image on many of its product detail pages. Clicking “play” swaps out the main image with a video showing off the product. The video will also play when a shopper first arrives on the product detail page. Saks Fifth Avenue’s site includes product demonstration videos on many product detail pages. Don’t be surprised if even small online retailers pick up on this trend and start to include product demonstration videos on site. Many online sellers offer fast one- or two-day delivery services. Some even offer these services for free. But still, delivery options are getting faster. Amazon offers one-hour delivery in New York City and free, two-day delivery elsewhere on the U.S. on tens of thousands of items for Amazon Prime members. Everline, a clothing-seller, offers a similar, one-hour delivery service in San Francisco and New York City for select products. 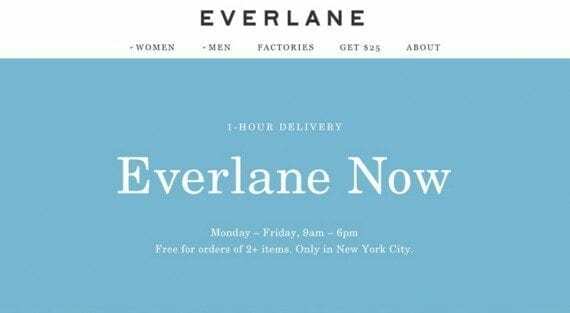 Everlane will delivery select products in New York City in an hour. French seller Hermès offers three-hour delivery in Paris. And many brick-and-click retailers are offering a click-and-collect service that puts products in a customer’s hands in little more than an hour. It may not be long before very rapid delivery is the norm. Mobile commerce, according to the iVentures’ findings, may be another area wherein not offering something puts a retailer at a disadvantage. For example, 91 percent of the sites reviewed were mobile optimized, meaning that having a mobile version of your site — preferably a responsive one — is essential. Some 91 percent of the sites surveyed were mobile optimized. In addition, half of the sites offered an iOS app and more than a third offered an Android app. Mobile apps were also popular. Half of the online sites iVentures reviewed offered an iOS mobile app and 37 percent offered an Android app. Often these mobile applications were used to augment in-store shopping experiences, including mobile payments, coupons, and offers for use in physical stores, store maps, and similar information. Online sellers, it would seem, must be ready to do business on mobile devices, especially if those sellers compete with brick-and-click stores. Merchants that sell both from physical stores and online are making something of a comeback. According to iVentures, 65 percent of the top 20 best performing sites are brick-and-click businesses, including Saks Fifth Avenue, Neiman Marcus, Nordstrom, Harrods, Macy’s, and Target. These stores are successfully integrating online and in-store shopping experiences. Often this includes offering click-and-collect or reserve-and-collect options, showing in-store availability online, and offering in-store mobile services or kiosks that allow shoppers to access additional items. This one may not be a fast growing trend, but omnichannel selling and its related services may lead to some pure-play ecommerce retailers to look at ways of showcasing products in the physical world.